Human brain is connected on multiple levels of organization: from cortical microcircuits built from dense networks of interconnected neurons to large resting state networks competing with each other. These levels are relevant while addressing different cognitive paradigms. For instance, in a famous study by Quiroga et al. (2005), a single neuron within the visual cortex was found to react to a particular face (now referred to as the Jennifer Aniston cell). However, cognitive dimensions which are a subject to most clinical studies, usually engage meso-scale brain networks: groups of interconnected brain regions which can be found with use of interventional cognitive studies combined with classic neuroimaging techniques such as functional Magnetic Resonance Imaging or electroencephalography. The Virtual Brain is dedicated to modelling neuronal activity on this meso-scale level of organisation. Why to even simulate brain activity? This simulator predicts neuroimaging recordings derived from a model specified by the user, and can serve to study subject-specific local sources of cognitive deficits. matrix of connectivity. This can be either anatomical connectivity, or a combination of anatomical and functional connectivity. Anatomical connectivity reflects the width of neuronal fibres projecting between different brain regions within the chosen network. This matrix can be derived from a Diffusion Tensor Imaging study. Functional connectivity the other hand, reflects the strength of statistical associations between activity in different brain regions. There is a variety of techniques to quantify the strength of functional connectivity in the brain in fMRI or EEG / MEG therefore the derivation of this matrix depends on the research questions specified by the user, and the properties of the datasets in the particular study. matrix of associated delays in communication between brain regions. These delays have a crucial influence on the dynamics in the network, as delays are known as rhythm generators. dynamical model to specify the nature of dynamic interaction between brain regions. Currently, a range of neural mass models are implemented in TVB. Dynamical models differ in terms of potential applications. For instance, Jansen & Rit model is a three-node dynamical system used to simulate alpha rhythms in the cortex, while Wong-Wang model is a system of two coupled non-linear equations, dedicated to modelling decision making in two-choice paradigms (winner-takes-all dynamics). Therefore, it is important to mind the tested predictions and choose the model which can best address the investigated research problem. The TVB software allows for further fine-tuning of the dynamical model, and tracking the generated dynamics in a simple two-node case before applying it to complex datasets (Fig. 1). Figure 1 Choosing models and parameters for simulation with TVB. A: specifying the (structural) connectivity matrix within the network. B: specifying the mathematical model characterizing the dynamics within this network. TVB has been applied to the clinics. As it gives predictions related to brain dynamics, a natural application for TVB are studies in dynamical disorders. Dynamical disorder means that the disorder involves events which can be mathematically described as bifurcations. An example of such a disorder is epilepsy: epileptic attacks are bursts of rapid activity which can be characterised as a Hopf bifurcation. In the context of studies on epilepsy, TVB was applied to predict spread and termination of epileptic seizures. According to this study, the spatiotemporal patterns of epileptic seizures are highly patient-specific, but can be predicted by modeling with use of TVB. Other cognitive disorders were also investigated with use of TVB, e.g. individual resting-state functional activity of patients with Alzheimer’s Disease was modelled with use fo TVB. This study demonstrated that model parameters required to accurately simulate empirical data correlate with cognitive performance. TVB was also applied to study the mechanisms underlying stroke, tumour, simulate the whole brain mouse dynamics, and perform multiscale modeling of resting state fMRI and EEG activity in humans. Figure 2 An example for application of TVB: simulated epileptic seizure in the mouse brain. The team around Virtual Brain involves a few research groups led by Victor Jirsa (Marseille), Randy McIntosh (Toronto), Petra Ritter (Berlin) and Jochen Mersmann (Stuttgart). The software was first introduced in 2012, and since then, the software was downloaded ~16,000 times (the package is available in three versions: for MAC OX, Windows and Linux). TVB is further growing, and has recently become an official part of the Human Brain Project. The project is open for collaborations. The core TVB software is implemented in Python, and allows for adding new dynamical models to the pool. If you are interested in contributing to TVB with your own code, you should join the TVB Google group. Furthermore, multiple TVB-related events are organised all around the globe, for past and future events check here. Quiroga RQ, Reddy L, Kreiman G, Koch C, Fried I. (2005). Invariant visual representation by single neurons in the human brain. Nature 435(7045):1102-7. doi:10.1038/nature03687. Bastos AM, Schoffelen JM (2016). A Tutorial Review of Functional Connectivity Analysis Methods and Their Interpretational Pitfalls. Front Syst Neurosci 9:175. doi: 10.3389/fnsys.2015.00175. Proix T, Jirsa VK, Bartolomei F, Guye M, Truccolo W (2018). Predicting the spatiotemporal diversity of seizure propagation and termination in human focal epilepsy. Nat Commun 9(1):1088. doi: 10.1038/s41467-018-02973-y. Zimmermann J, Perry A, Breakspear M, Schirner M, Sachdev P, Wen W, Kochan NA, Mapstone M, Ritter P, McIntosh AR, Solodkin A.Differentiation of Alzheimer's disease based on local and global parameters in personalized Virtual Brain models. Neuroimage Clin 19:240-251. doi: 10.1016/j.nicl.2018.04.017. Falcon MI, Riley JD, Jirsa V, McIntosh AR, Shereen AD, Chen EE, Solodkin A (2015). The Virtual Brain: Modeling Biological Correlates of Recovery after Chronic Stroke. Front Neurol 6:228. doi: 10.3389/fneur.2015.00228. Melozzi F, Woodman MM, Jirsa VK, Bernard C (2017). 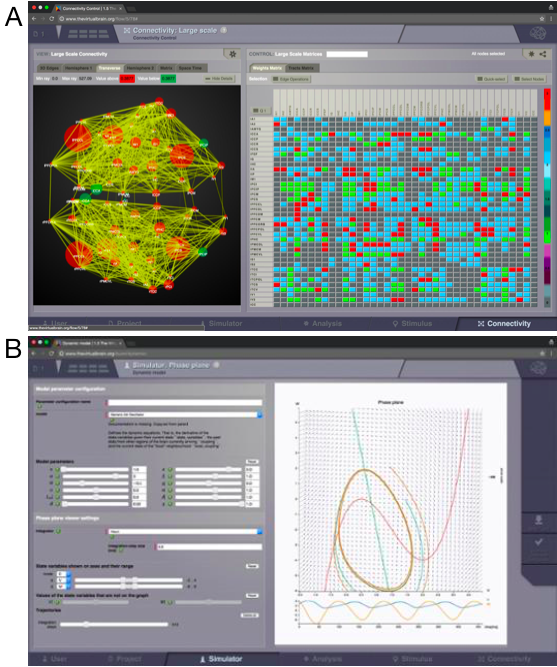 The Virtual Mouse Brain: A Computational Neuroinformatics Platform to Study Whole Mouse Brain Dynamics. eNeuro 4(3). doi: 10.1523/ENEURO.0111-17.2017. Schirner M, McIntosh AR, Jirsa V, Deco G, Ritter P (2018). Inferring multi-scale neural mechanisms with brain network modelling. Elife 8;7. doi: 10.7554/eLife.28927.